The Scotiabank Giller Prize longlist was released on Monday, revealing the jury's top 13 picks in Canadian fiction. The top 13 titles were selected from 147 books, submitted by 81 publishers from every region of the country. 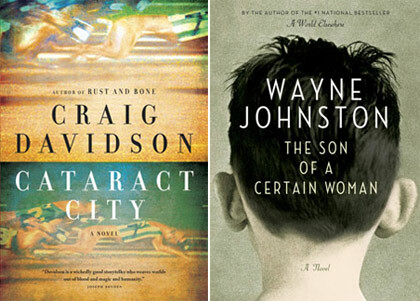 UNB alumnus Craig Davidson (MA’03) was nominated for his novel Cataract City, published by Doubleday Canada. Wayne Johnston (MA’85, DLitt’03) was listed for his novel The Son of a Certain Woman, published by Knopf Canada. Craig Davidson and fellow 2013 longlist author Elisabeth De Mariaffi (nominated for her short story collection, How to Get Along with Women) are also featured in the Summer 2013 Fiction issue of The Fiddlehead, published quarterly by the University of New Brunswick. For more on this year’s Giller Prize longlist, see Scotiabank Giller Prize longlist filled with recognizable names in the National Post. The shortlist will be unveiled on October 8, while the winner will be announced at a gala ceremony in Toronto on November 5. The winner receives $50,000 while the nominees each take home $5,000. Wayne Johnston will be reading from his new book on October 3 on the Fredericton campus, and October 4 on the Saint John campus.